Do you dream to be the king of the dinosaur world? Our dinosaur costume can make your dream comes true. 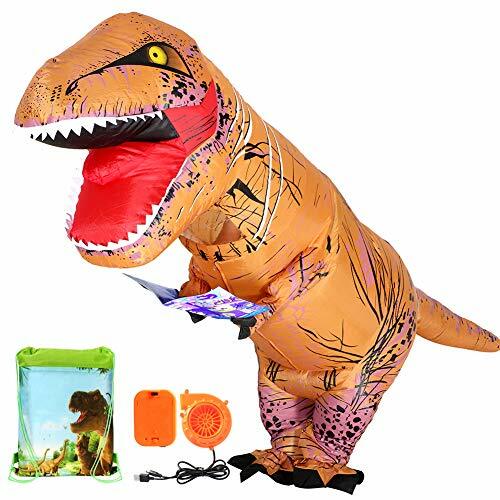 This adult inflatable dinosaur costume is one size fits all (4.9 ft to 6.5 ft person). Our inflatable costume is made with 100% polyester material. It is ultra-durable, waterproof, and lightweight, ensuring the utmost comfort. Our product also comes with instructions. However, the inflatable costume is very easy to setup. Simply step into the costume, turn on the fan (discreetly hidden inside the outfit) and it will be fully inflated within 90 seconds. The inflatable costume suit for party, games, bars, clubs, parks, television programs, supermarket chains, hotel chains, the annual events, carnival, festival, company annual meeting, opening ceremonies, weddings and so on. Keep away from fire ,the material is not fireproof ,it's dangerous to close the fire. After taking off costume,switch battery-pack to OFF position and remove batteries. Buy with confidence as we offer 100% risk free money back guarantee, no questions asked. However, we are confident that you will enjoy the superior quality of our T-Rex costume and will be satisfied with the purchase. If you have any questions about this product by ANNTOY, contact us by completing and submitting the form below. If you are looking for a specif part number, please include it with your message.